Sidney Kimmel, who donated $35 million to construction of the Philadelphia Orchestra's home on South Broad Street, has listed homes in Malibu and New York City. 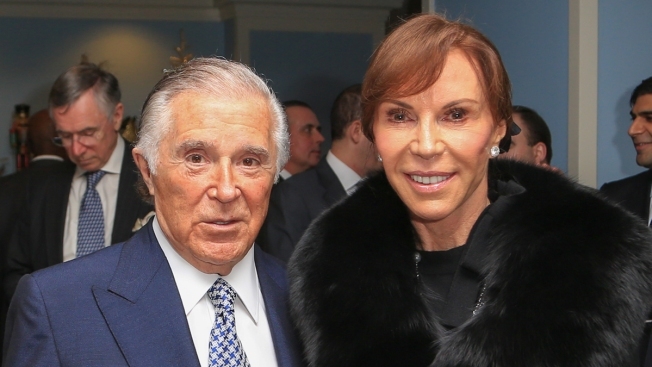 Philadelphia billionaire Sidney Kimmel, left, and his wife, Caroline, seen here in 2012, have more than $100 million in two real estate listings currently on the market: a $65-million Malibu estate once owned by Johnny Carson and a $39 million apartment at the Ritz-Carlton Residences in Manhattan. A billionaire movie producer and philanthropist, born to a West Philadelphia cab driver and producer of the recent Hollywood hit "Crazy Rich Asians," is asking for more than $100 million for two of his homes. Sidney Kimmel, who made his fortune in clothing, has had a Malibu, Calif., estate on the market for $65 million for over a year, and this month listed his New York City apartment for $39 million, according to published reports. The Malibu property was initially listed in 2017 for more than $80 million, but was reduced to its current asking price in August. The 7,000-square-foot oceanfront house was built in 1978 and originally owned for two decades by "Tonight" show host, Johnny Carson. Kimmel bought it from the widow of Carson in 2007 for $45 million, according to a report in The Los Angeles Times. Kimmel, whose clothing company Jones Apparel Co. was sold in 2014 for $2.2 billion, has been a movie producer for decades. He is credited with more than 55 titles since the 1980s. He recently struck another Hollywood hit with "Crazy Rich Asians" earlier this year. The New York City apartment is an entire floor at the Ritz-Carlton Residences on Central Park South. It is 8,000 square feet, including a master bedroom that is 2,000 square feet all by itself. It also has sweeping views of Central Park, quite a lifetime away for the 90-year-old born in 1928 in West Philadelphia. "Sidney Kimmel grew up in Philadelphia during the Great Depression. There can be no doubt that his ambition and drive are products of those hard times," according to a biography on his foundation's website. He is listed by Forbes as worth $1.3 billion and is a leading cancer research donor in addition to his giving to construction of the Kimmel Center for Performing Arts on South Broad Street and other cultural institutions. In 2014, he gave $110 million to Jefferson Medical College, which was renamed the Sidney Kimmel Medical College of Thomas Jefferson University. He spent a short time at Temple University before going into the garment industry. He founded Jones New York in the 1960s, and grew the company to include brands like Nine West, Anne Klein, Stuart Weitzman, Joan & David, Gloria Vanderbilt, Barneys New York and Kurt Geiger. He took the company public in 1991, and ramped up his charitable efforts. A decade later, in 2002, he stepped down as CEO, but remained chairman until 2014 when Jones was sold to Sycamore Partners, a private equity firm.